This Christmas Around the World unit is designed to introduce students to how different cultures across the world celebrate winter holidays. 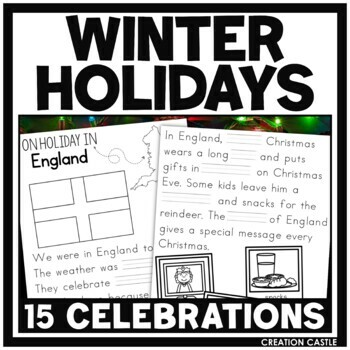 Look at the preview to get a closer look at this winter holidays around the world resource and craft examples! What countries and holidays are covered in this resource? Since many places around the world celebrate the winter holiday season differently, there are fifteen different celebrations included in this resource. Wow, that is a lot of holidays! There is no way I can cover this much material. Do I really need this resource? I agree – there is definitely not time to cover all the material covered in your resource. Having so many options lets you plan the best “Winter Holidays Around the World” unit for you and your classroom. Since each country/celebration comes with the same types of resources, you can create consistency throughout your unit. This is also helpful if you are teaching the unit across your entire grade level. For example, if you are teaching about Christmas in Germany and the teacher across the hall is teaching about Christmas in England, you both could use the same types of materials. I don’t know much about holidays and traditions that I don’t celebrate. How will I know what to teach my students? In your download, there is an informational page written for you that highlights some of the customs of each holiday. The teacher guide is included to provide you with some background information on the traditions of each country, however there are many more than what is included. You can also find more in depth information for the traditions and customs mentioned on the internet or in books such as Christmas Around the World by Mary Lankford. For each country, you also receive a letter/note from a snowman that highlights a tradition or two from each celebration. 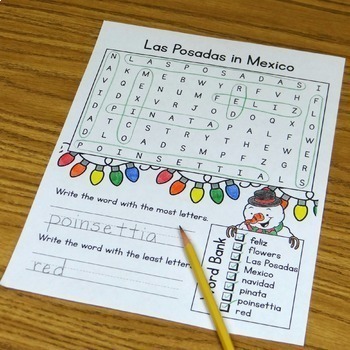 What is the best way to utilize this resource in a kindergarten or first grade classroom? Are there crafts included in this resource? Yes! At this time there is one craft per country/celebration. All the crafts are in a print and go format, meaning you need no additional materials aside from paper, crayons, and glue. How is this resource organized? Your download comes in a ZIP file with two options. You can choose to print your resource by country or by activity. I want my students to “travel” around the world as we complete this unit. How can I do that? Your download comes with a passport for your students and a page of stamps for each country that you visit. Many teachers choose to set up their chairs like seats on a plane or train and have students “travel” to each destination. Another fun way to incorporate traveling is to use brown paper bags from a grocery store as suitcases! Students can store all their materials and crafts for your unit in their “suitcase” and take everything home at the end of the month. I don’t have time to do a full Christmas Around the World unit. Do you have any quick no-prep Christmas resources? 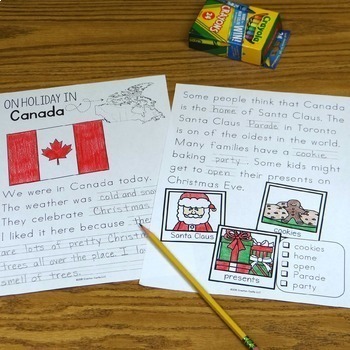 If you’re looking for a no-prep pack about Christmas to use for morning work or send home as a winter break pack, you may be interested in my Kindergarten Christmas Around the World No Prep Worksheets. Resource Ranch offers a similar resource for first grade! The country/celebration I want to cover is not included. Can you add it to your resource? There are so many wonderful holidays during the winter months. At this time I will not be adding any other countries or celebrations to this pack.